The 21st century cloud accounting firm isn’t your father’s CPA practice – and in a few years, won’t even look like the firms you see today. 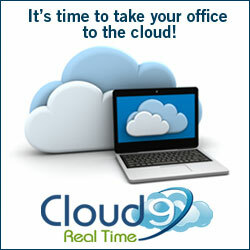 Cloud computing is altering the way businesses conduct business. Now you can reach virtually all data, and complete virtually any sort of financial transaction from literally anywhere. With an emerging panoply of new resources, why would you limit your accounting wares to a desktop computer or office server? You had best expect that your business competitors have either already adopted SaaS (software as a service) and DMS (document management solutions), are in the process of adopting these types of cloud services, or they are somewhere in the decision, planning, or provider selection cycle. One promise is that the cloud offers a steep drop in information-technology costs, since applications are hosted by the vendors and provided on demand, rather than via physical installations or seat licenses. For companies that can afford to manage their data internally, the hang-up with using cloud solutions has always been concern that the information will be less secure if stored off-site. But many small and midsize companies will find that cloud solutions make it affordable to achieve the necessary level of security, especially given new federal and state regulations for protecting customer data, says Jim Bourke, partner in charge of technology at Northeast regional accounting firm WithumSmith+Brown. Lower IT Costs – With cloud accounting, you no longer have to spend time and money updating hardware and software every time a new version of something comes out. Because the software is hosted remotely and updated by the provider, both you and your client are always working with real-time data in the same version. Compatibility issues are a thing of the past. Easy Access – Your clients will love having the ability to generate financial reports from anywhere in the world. Your accounting firm will benefit from less travel time and fewer on-site client visits. Scalability – When your clients expand their business operations, they don’t have to find a new accounting solution to match their changing needs. Most cloud computing applications are subscription-based, which means that you can add features and functionality as it is needed, and you don’t have to pay for features that you don’t need. Flexibility – The ways that your clients can use cloud accounting to streamline operations is endless. Travel expenses can be logged on the road, making expense reports a snap. Employees can track their time and submit timesheets from anywhere, making payroll processing substantially faster. Many cloud computing solutions also allow you to integrate other business solutions such as an enterprise resource planning system or client relationship management program. If your clients are using cloud-based systems in other business areas, it’s just a matter of time before they seek a similar solution for their accounting needs. Preparing your accounting firm for the inevitable shift to the cloud will help you keep the clients you already have and increase your client base as you provide more and more value-added services. 1. Do we need to replace our servers? If so, now may be a good time to transition some of your applications to a cloud computing environment so you can spend less money on new servers. 2. Is our bandwidth adequate and are our switches up to date? Cloud computing generally calls for a premium Internet connection to ensure acceptable functionality. 3. Is our IT staff ready? Under cloud computing, your IT department will have to focus more on processes, workflow and client service than on infrastructure maintenance. Although there are a plethora of methods to conduct business, choosing the most cost-effective and time-efficient technologies will allow your business to keep or develop its competitive edge and boost profitability well into the future. Picking the right document/content management system, selecting supporting technologies that accompany it, and migrating to the cloud model of computing thrusts even the most rudimentary business or accounting firm into the 21st Century. Remember us – Cloud9 Real Time was voted THE #1 Accounting Cloud platform by more CPAs in the CPA Technology Advisor 2012 Readers’ Choice Poll. Ready for a demo and free trial for your business?